Not all SMS marketing campaigns are created equal. There are some companies who fully integrate SMS marketing into their business strategy and others who see it as a side project. According to a survey by ScanLife, 89% of customers use their mobile phones while shopping, and 64% of Americans own a smartphone as of 2015. Given this, which company do you think will have a more successful marketing campaign? 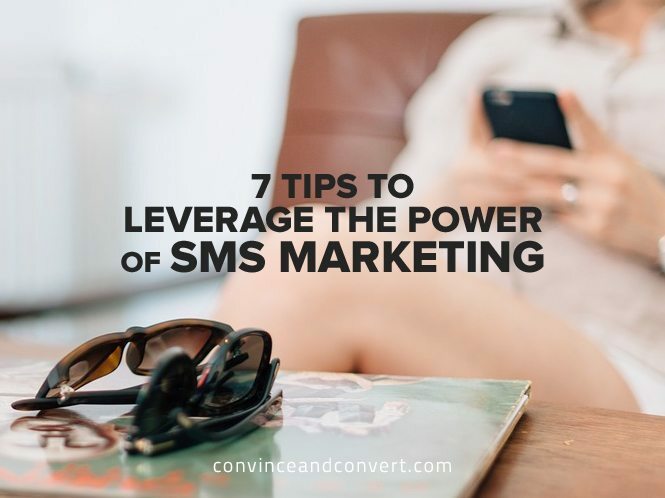 If you’re already on board with SMS marketing, here are some tips and suggestions on how to maximize your success. Large SMS marketing campaigns aren’t DIY. You’ll need a variety of skilled professionals in order to get the most out of your marketing strategy. One or a few people may fill several of these roles, but you’ll need: an SMS marketing program expert, a retail expert, coordinators for on-location signage, digital creative designers, social media experts, a promotions specialist, an ROI and discount budget analyst, and more. Use a CRM (Customer Relationship Management) app to measure the success of your messages. For more info on the best CRMs available, check out this ultimate guide. Analyze purchase history and location-based demographics, so you can send the right messages to the right customers. If you’re a cosmetics line, don’t send an anti-wrinkle cream coupon to a twenty year old for your store in Houston when she lives in Boston. Segment your clients for targeted promotions. Send bulk messages for general sales and promotions that anyone anywhere could take advantage of. Get to the point: You have 160 characters to express yourself. Do it in less if you can. Make sure the message is clear and concise, written in plain English. Avoid abbreviations, emoticons, and all caps. Don’t use open-ended messages. An example of an open-ended message is one that invites clients to a sale but doesn’t say when the sale ends. The client has no idea if it is for a day or a month. By giving a specific date when a sale ends or putting an expiration date on a coupon, clients are more likely to act because you’ve given them enough information and incentive. Calls-to-action increase customer engagement with your SMS marketing texts. That’s exactly what you want from them: to be engaged, to value the texts you send, to read them, interact with them, and act on them. “Click here.” Sometimes you don’t have enough space in your SMS message to include all the information your customer will need. Maybe you’re hosting an event, and you want to add a link to a map or a video about the event or a link to your website where there are more details. In that case, a “Click here” button will provide a link to the necessary details. Text-to-Win. Lots of customers would be interested in having a shot at winning a prize or gift from your company. Asking them to text in order to enter the contest helps increase customers’ engagement. If you’re not offering a sale or hosting an event, Text-to-Win campaigns are an effective way to remind customers of your existence and continue increasing traffic and sales. Text-to-Vote. Engage customers in mobile polling to find out how your company is doing in terms of service, product quality, prices, and more. “Buy now.” This is the perfect CTA button for targeted messages. If you know a customer routinely buys a certain product, you can send a text promoting that product with a “Buy now” button to make it easier for them to make a purchase. SMS is all about immediacy. It takes people an average of three minutes to open messages. Clients’ responses to sales, promotions, and events promoted on SMS are most effective when they’re last-minute impulses. If you have a store opening event on Friday night, send the message Friday afternoon. If you have a dinner promotion at your restaurant, send it at the end of the workday, not in the morning. Be careful not to tread on thin ice by sending messages out too early in the morning or too late at night. Acceptable hours are between 8am and 9pm. Take SMS timing one step further by finding out the best time to send a message to a specific individual based on their past interactions with your texts. This ultra-targeting goes beyond region and demographics and customizes your marketing to optimize results. Social Media. Add a “Mobile Number” field to your Facebook page sign up and an “Opt-in” button for them to sign on to your SMS campaign. Website. Make sure SMS opt-in is a prominent feature on your website. Newsletter. Make SMS opt-in visible on your newsletter. Point-of-sale. Make sure employees are asking if customers want to opt-in for SMS texts for promotions and sales. Snail mail. When you send coupons or promotional mail through the post, make sure instructions for SMS opt-in are printed on it. Your best clients are the ones who are loyal, who buy consistently from you, who give you feedback, and who promote your brand to their friends and family. A smart strategy is to identify this circle of customers (influencers) and dedicate extra time and resources to them. They know and love your brand, so use their knowledge to your advantage, and send them more in-depth polling questions than you send to your bulk clients. Also, they’re your company’s VIP, so treat them as such. Reward their dedication with special offers and extra benefits. Want to read more? Take a look at these case studies on how big brands have used SMS campaigns successfully to promote sales and increase customer satisfaction. No matter what kind of company you own, you can maximize the benefits of your SMS campaign by dedicating time to crafting effective messages, analyzing your customer demographics, investing in an SMS-specific sales marketing team, and promoting your SMS campaign throughout your company’s media.